MHONDORO SAFARI LODGE & VILLA is located in the malaria-free, Welgevonden Game Reserve in the Waterberg (Limpopo province). 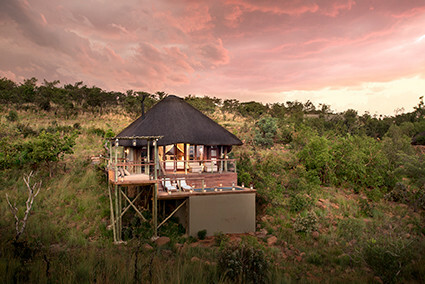 The exclusive 5-star safari lodge accommodates 20 guests in luxury suites, including a child-friendly Family suite and a romantic Honeymoon suite, and is a 2h45-minute drive or a 50-minute flight from Johannesburg. Mhondoro Villa is the ultimate in luxury and privacy for families or friends travelling together and comes with a chef, butler and dedicated guide with a game viewing vehicle. 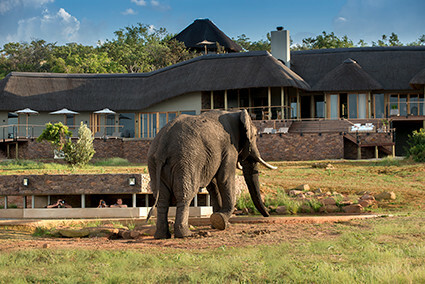 Unique features include a custom-built ‘star deck’ and a waterhole with underground game viewing hide connected with the main lodge by a tunnel, as well as a gym, heated swimming pools and a Spa Suite with a private, outdoor spa deck. The breathtaking landscape is rich and diverse, stretching across 35 000 hectares. The reserve offers excellent game viewing and is home to the ‘Big 5’, including a large white rhino population. Johannesburg is at 2.45 hours drive. From R5675 per person sharing per night (all year round except peak season 14 Dec to 10 Jan R7530 per person sharing per night). VILLA (all year round): R45 455 per night for 4 people sharing, R9 091 per extra adult and R5 051 per extra child between 3 and 11 years old. Accommodation, all meals, teas & coffees, soft drinks, local branded beers and hand-select house wines. Two safari activities per day, including game drives in open vehicles or walking safaris with Mhondoro guide. Return scheduled transfers from Welgevonden Reserve Main Gate or Welgevonden Airstrip to Mhondoro Game Lodge. Mhondoro is child-friendly and malaria-free. In the interest of conservation, no private vehicles are allowed in the reserve. Private vehicles are parked in a secure area at the Welgevonden Main Gate from where Mhondoro provides a complimentary scheduled transfer to and from the lodge in an open safari vehicle, which takes approximately 50-60 min.